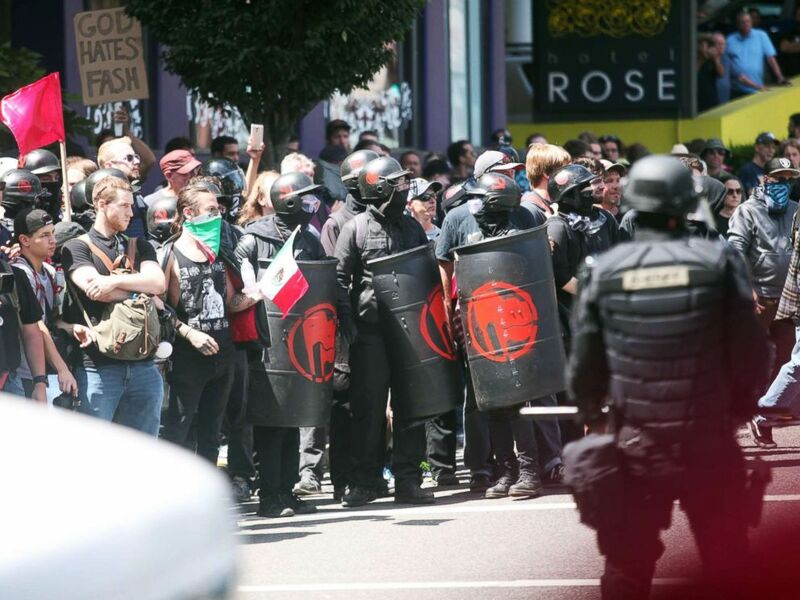 Four people were arrested Saturday as a conservative Patriot Prayer rally broke out into violence with opposing anti-fascist protesters and police in Portland, Oregon. The city, which had been bracing for the potential violence, mobilized a massive police presence in the area of Tom McCall Waterfront Park in the heart of downtown. 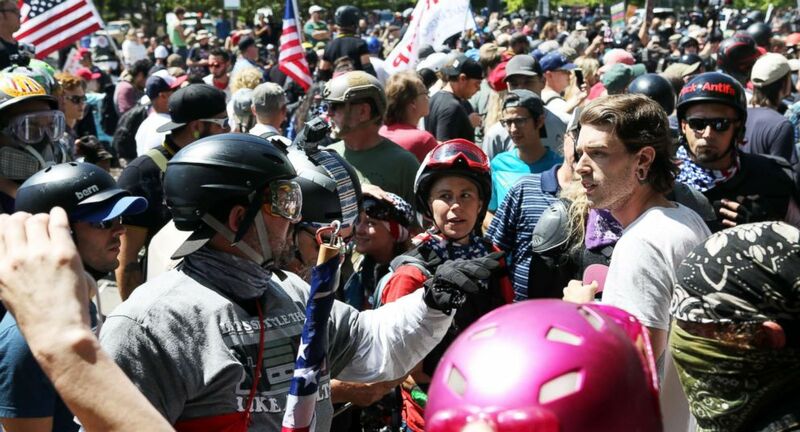 The Patriot Prayer protest, organized by political activist Joey Gibson, kicked off midday Saturday, but it didn't take long before police were calling for the hundreds of assembled people to clear the streets. Police search a person before entering a rally in Portland, Ore., Saturday, Aug. 4, 2018. According to police, protesters surrounded police cars, threw rocks, firework mortars and bottles and put officers in danger, necessitating trucks to announce, "All people in this area must disperse." They were warned arrests would follow. Three police cars were damaged by protesters, police said. No officers were injured. 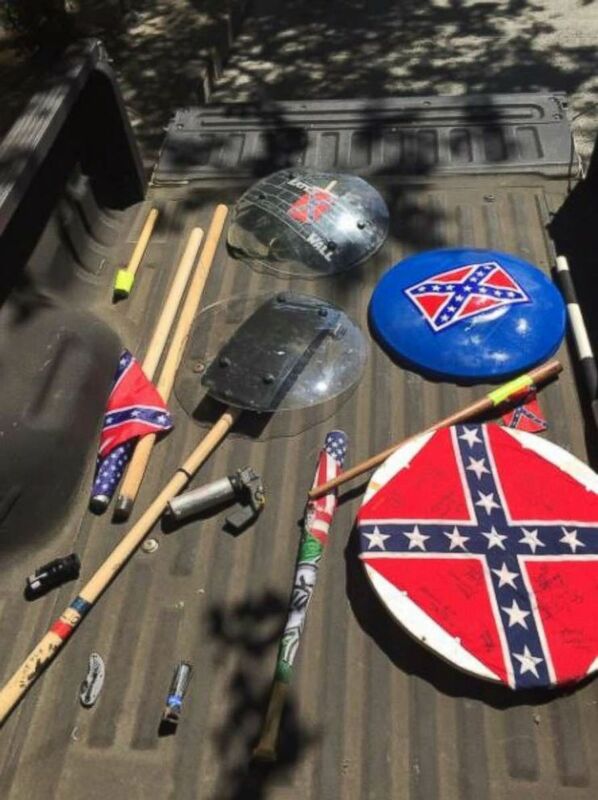 Protesters were searched as they headed into the park and multiple weapons were confiscated, including clubs, a baseball bat and shields emblazoned with the Confederate flag. 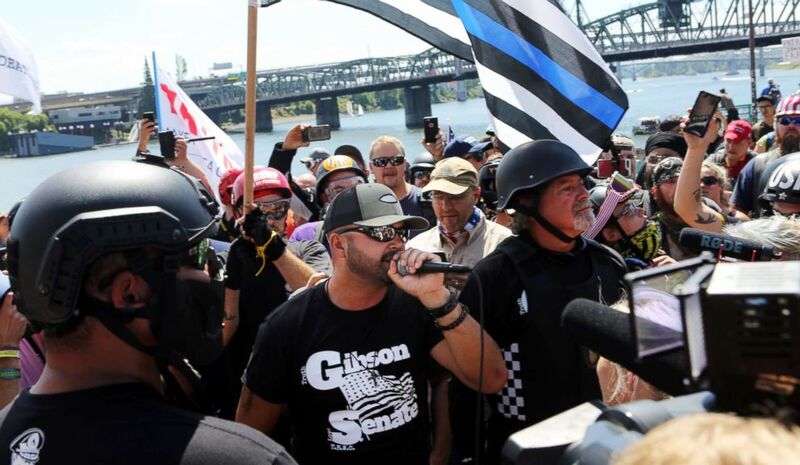 People on all sides of the political spectrum gather for a campaign rally organized by right-wing organizer and Patriot Prayer founder Joey Gibson in Portland, Oregon, August 4, 2018. 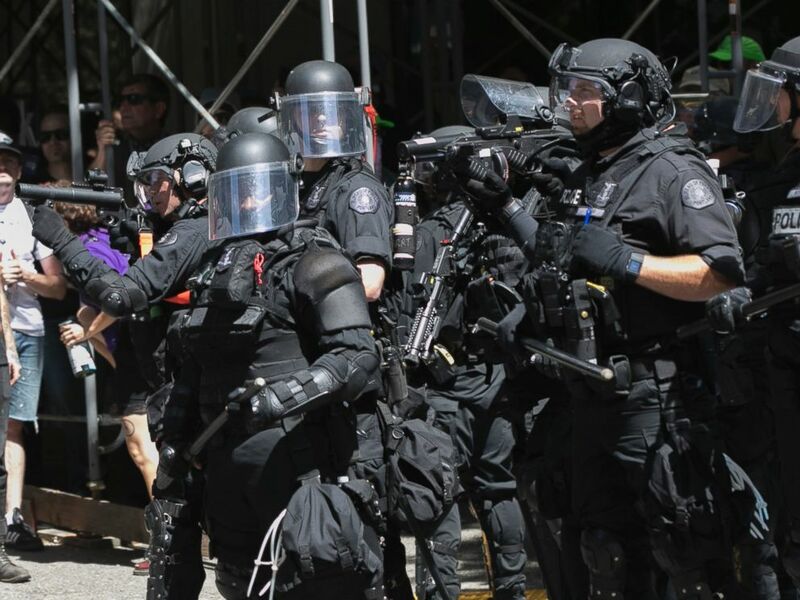 Portland police seized clubs, shields, baseball bats and even pepper spray from protesters during the rally, Saturday, Aug. 4, 2018. "The intent of law enforcement today was to provide a safe environment for all participants, non-participants, and community members while ensuring the peaceful exercise of the First Amendment," the police department said in a statement. 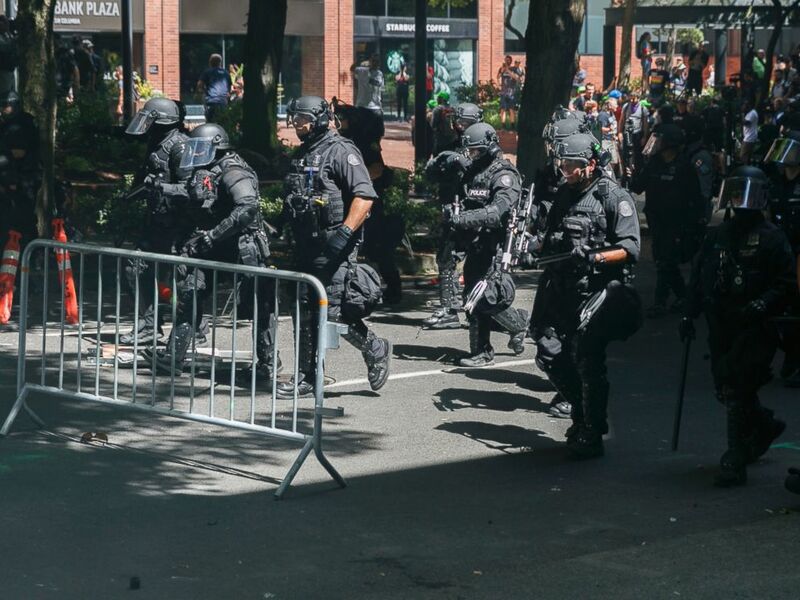 The Portland Police Department said several types of "less lethal impact munitions" were used to disperse crowds, including an aerial distraction device, .60-caliber less lethal rounds, Stinger grenades (which blast light and launch rubber pellets), foam-tipped bullets and pepper spray. Several people suffered minor injuries, though it was unclear how many. Ric Peavyhouse, a photographer for Portland ABC affiliate KATU, was injured by a bean bag round, the station reported. Eder Campuzano, a reporter for The Oregonian, also said on Twitter he was bloodied by a projectile, but was "okay": "En route to get looked at but you’ve seen the worst. Thanks for the concern and stay safe out there, fellow journos." An alt-right sympathizer,confronts another protester at a rally that was held in Portland, Oregon, August 4, 2018. Police move in on protesters during a rally in Portland, Ore., Saturday, Aug. 4, 2018. 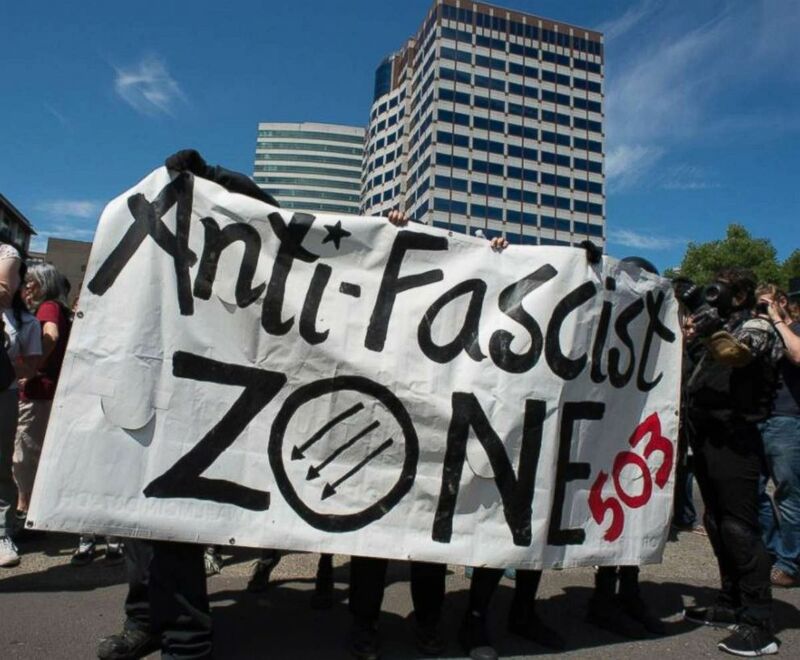 Small scuffles broke out Saturday as police in Portland, Oregon, deployed "flash bang" devices to disperse hundreds of right-wing and anti-fascist protesters. Gibson is a controversial figure, described by some as a member of the alt-right movement and his rallies have been attended by white supremacists, though he disavows both and refers to himself as a libertarian. He is running for Senate in Washington as a Republican against incumbent Democrat Maria Cantwell. 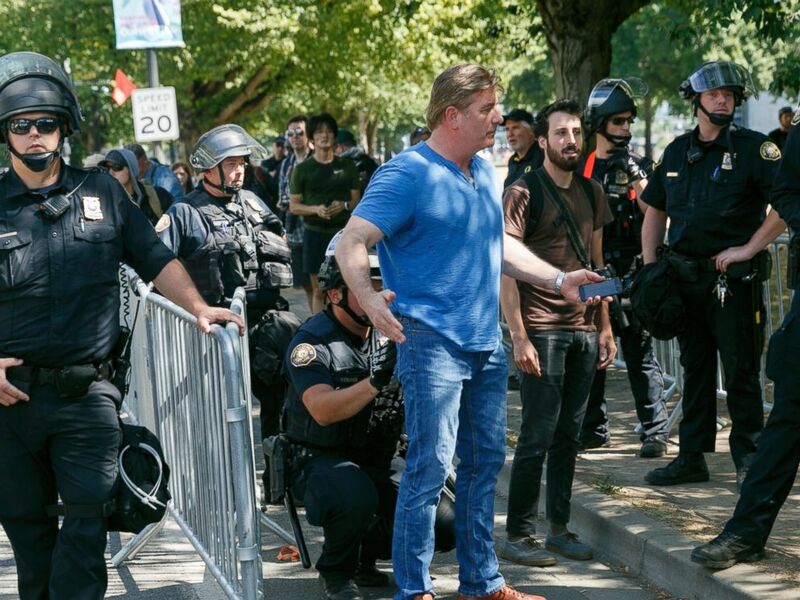 He has organized three rallies in Portland, a largely liberal enclave, since June 4, each one met by spasms of violence as so-called antifa protesters clashed with Patriot Prayer members. "Stay here. Stay strong. And stay patient. We have a long day ahead of us. We're going to make history today," Gibson, wearing a T-shirt with "Gibson for Senate" on it, said upon arriving at the Saturday event, according to KATU. Joey Gibson, center, rally organizer and Patriot Prayer founder addresses alt-right activists in Portland, Oregon, August 4, 2018. Antifa, or anti-fascist, protesters showed up in Portland, Ore., to counter the "Patriot Prayer" rally held on Saturday, Aug. 4, 2018. The group Pop Mob was among those who organized against Gibson's group. "Patriot Prayer is continuing to commit violence in our city, and their events are becoming more and more violent," Effie Baum of Pop Mob, a coalition of community groups organizing the counter-demonstration, told KATU. "Leaving them a small group to attack in the streets is only going to allow them to perpetuate their violence."